If you miss custard creams or just crave them, then you can make them yourself with a few simple ingredients from your pantry and a little custard powder. 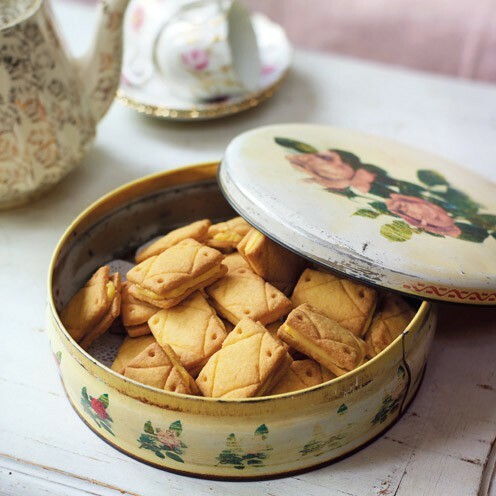 This recipe for custard cream cookies is from Good Housekeeping UK. I first made this recipe before I had a kitchen scale (more on this later). For the biscuits, put the flour, custard powder, baking powder, sugar and butter into a food processor, or use a fork and mix until the mixture resembles fine crumbs. Alternatively, rub the butter into the flour mixture using your fingertips. Add the egg and milk and mix until the mixture just comes together. Tip onto a work surface, bring together with your hands, then wrap in plastic wrap and chill for at least 30 mins or up to 1 day. Preheat oven to 350°F. Line two baking sheets with parchment paper. Lightly flour a work surface and roll out dough until 3mm (⅛in) thick. Cut it into an even number of 3cm x 4.5cm (1¼in x 1¾in) rectangles, re-rolling trimmings as needed. If you like, mark the rectangles with a diamond and a dot in each corner. Put rectangles on prepared sheets and bake for 13-15 minutes until lightly golden. Cool on the sheet for 3 minutes, then transfer to a wire rack to cool completely. Meanwhile, put the softened butter into a large bowl and sift over icing sugar and custard powder. Mix to combine (don’t add water as it needs to be fairly thick). Set aside. When the biscuits are cool, sandwich together with some of the filling, using a knife, spatula, or a piping bag if you want a less messy finish. Awesome custard cookie – Perfect for the festive season – I am going to test this one. If you have a moment, feel free to hop over and see what’s cooking on my end. Thanks in advance.